At the start of sailing season, a scene repeats itself with astonishing regularity. Masts are lowered into place by crane or pushed upright by beefy friends, resembling the World War II flag raising on Iwo Jima. This activity is usually accompanied by plenty of shouting as helpers scurry about the deck, slipping clevis and cotter pins or other hardware into fittings designed to secure stays or shrouds. Once the mast stops wobbling, rusty turnbuckles are given a few cranks to ensure rigidity, and if all looks plumb to the collective eyeballs on hand, the boat is ready to go. Unfortunately, nothing could be further from the truth in terms of rig readiness. In his book, The Complete Rigger's Apprentice, Brion Toss emphasizes that the rig exists to distribute the strain from the sails in such a way that the boat moves through the water to optimum effect. As he puts it, "Without careful tuning, all you've got is a bunch of wires hanging off the mast. This business of bringing the vessel to life involves knitting everything together so that, as nearly as possible, all strains are shared and no single member takes a disproportionate load." Back to the boats at the dock. It's here, and not at sea, that rig tuning should begin. Inspect the wood or fiberglass where the chainplates are bolted to the hull for rot or decomposition. Make sure the mast is snug in its collar blocks or tabernacle mount. If keel stepped, check to see the base of the mast is resting firmly. Then lubricate your turnbuckles. There are many products on the market made for this purpose. With the mast centered and straight up-meaning it's not leaning to port or starboard-slowly tighten the turnbuckles, alternating locations as you might when cranking on lugs during an automobile tire change. Lay on your back on the deck and sight up the mast track. Then get off the boat, walk several feet away and view the mast from various angles. If all looks satisfactory, you have completed the rough tuning stage. The next thing to consider is degree of stretch. Wire stretches under load. As a general rule, the longer the wire and the more heavily loaded, the more it will stretch. Although professional riggers, particularly those accustomed to race boats, frequently discuss how performance is enhanced by precise tuning, an increase in hull speed isn't the only reason to tune your rig. A properly tuned rig will increase the life of your sails and dramatically reduce the probability of the mast toppling onto the deck in heavy wind or rough seas. Information found in sailmaker and boat manufacturer rig tuning guides tends toward specific, which means each vessel should be tweaked to its own characteristics. But any guide is a good place to gain basic understanding of how the rig functions and why tuning is important. For example, most guides recommend you begin tuning by ensuring no adjustable rigging is tight. So loosen the mainsheet, vang, babystay and backstay. Whether your boat has two, three or four sets of spreaders really doesn't change the task at hand. Take note if your boat has continuous or discontinuous rigging. Continuous rigging means just that: a shroud begins on deck where it's attached to a turnbuckle and chain plate, makes its way upward to the spreader tips and masthead, then returns to the deck where it is fastened to a different turnbuckle and chainplate. Discontinuous rigging simply starts at the deck and ends at a prescribed location on the mast. Among the most important measurements that must be taken during the rig tuning process involves determining whether the shrouds on port and starboard are equidistant from mast to gunwale or deck fitting. 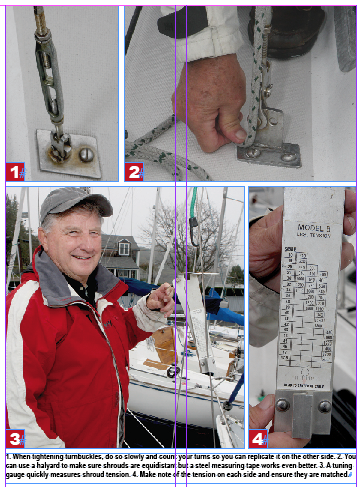 Some sailors use a halyard or topping lift to take these measurements, but halyards can stretch and there's no guarantee the chainplates on both sides of the boat are symmetrical. Rather than rely on the halyard method, use a retractable steel tape capable of measuring up to 100 feet, like those favored by landscape architects and builders. Cleat off the main halyard with plenty of slack and attach the tape to the end of the halyard normally clipped to the mainsail. Assume the masthead sheave is centered and hoist away. Measure the distance from masthead to rail and try to make it equal on both sides. If your numbers fall within a half inch, you should be fine. To determine whether the forward chainplates on both port and starboard gunwales are symmetrical, measure the distance from the forestay chainplate to where the forward shroud attaches to the toe rail. Most likely, the measurements will coincide, but if not, at least you will be alerted to the difference. Once you are satisfied that the shrouds are equidistant, slowing tighten the turnbuckles, starting from the top down. Keep count of the turns. This procedure is called lateral tuning. A mast should not move athwartships, meaning side to side. If the mast seems straight, it's time to work on the rake-the bend or tilt of the mast fore and aft. The rake is tweaked by turning the forestay turnbuckle and adjusting the backstay. Lay on your back and take another look up the mast track. Some masts are pre-bent so check with the manufacturer. When the rake seems right, continue hand-tightening the shroud turnbuckles. Give the intermediate shrouds a few less turns than the uppers. Once again, keep record of how many full turns you make. Neither forestay nor backstay should be flopping at this point. Of course, all of this depends on where you sail and typically in what kind of local weather conditions. Generally speaking, when sailing in light air, the forestay can be somewhat loose, with adjustments made at the backstay. Some rigging manuals suggest when sailing in a moderate breeze at 20 degrees angle of heel, the leeward upper shroud should be snug, which means void of visible slack but not fiddle-string tight. Further, if the lower shrouds are too loose, the mast will sag at the spreaders when under load. Most sailors agree if the mast is raked aft, the result is an increase in weather helm. A mask raked forward can reduce weather helm, but bend too far and you'll end up with lee helm, which many sailors contend is worse. Your goal is to achieve helm balance. If the rake appears correctly calibrated, equally hand-tighten the backstay and forestay. Remember to count the turns. You don't want to change the rake by over-cranking the stays. Adjustments can also be made while under sail. For example, tensioning the backstay simultaneously tightens the forestay, which in turn reduces headstay sag. By decreasing that sag, you flatten the genoa and improve upwind performance in heavy air. Tensioning the backstay also causes the mast to bend backward, which helps flatten the mainsail. It is also worthwile to look up the mast while sailing on each tack to ensure the mast isn't falling off to one side under sail. As a general rule, the maximum headstay tension should be about 16% of the wire's breaking strength. If a 3/16th-inch wire has a breaking strength of 4,700 pounds, the headstay tension should be 750 pounds. Easy-to-use portable gauges are designed to measure this tension. When fully satisfied your rig is tuned, insert stainless cotter pins into the turnbuckles, but bend them to 30 degrees, not 90 as many sailors do, then wrap them with tape. One layer of sticky black friction tape for cushioning beneath a layer of white electrician tape for aesthetics is recommended. No matter your preference, make sure you leave a drain hole to keep rain or seawater from pooling inside the turnbuckle.